Although I wrote everything I know about squirrel issues for this website, oftentimes a problem with squirrels in the attic is beyond the scope of the do-it-yourself homeowner to solve. I have found a professional company in Baltimore, Maryland that handles problems with wildlife. KP Wildlife Control has access to tools, techniques, and experience that help them do a far better job at wildlife removal than a non-experienced homeowner could. They possess licensing that allows them to do certain types of work legally, that non-licensed homeowners in the state of Maryland are not allowed to do. For the welfare of your situation, and the squirrels, in some cases it's best to hire a pro. There are good companies and bad companies out there. I've done research on such companies, to get to know them, and feel confident recommending their services. 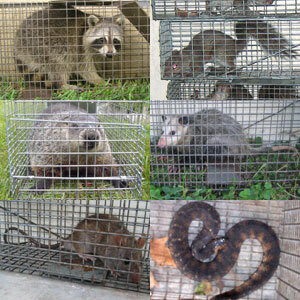 I therefore recommend a company called KP Wildlife Control which services Baltimore, Maryland. If you have a squirrel problem, or any other conflict with a wild animal, and live in Baltimore, I am confident that this company, KP Wildlife Control, is the one to call. I asked the company to describe their service range, and they said this - We service several towns, including animal control in Columbia MD, Reisterstown, Timonium, Lutherville, Perry Hall, Towson, Parkville, Pikesville, Middle River, Essex MD, Dundalk, and wildlife trapping in Glen Burnie, Riviera Beach, Severn, Elkridge, Eillicot City, Columbia MD, Catonsville, Randallstown, and more. KP Wildlife Control operates 24/7, so don't hesitate to call at any time to discuss your wildlife problem, and schedule an appointment for same-day or next-day service. I found your article online but my situation seems to be different - there are at least 2 squirrels in my attic and the don't seem to be able to get out - they are panicking? Running frantically back and forth with other squirrels chirping on the roof. This is so unnerving and I'm afraid they are going to cause some major damage. Your website is amazing. My husband and I live and own a nearly 100 year old Baltomore row home. We have hear a scuffling in the ceiling that makes us think there is a squirrel gaining access to the very small space between the ceiling and the roof. There is no attic just a space between 10" to 36". We haven't done much roof investigating yet since our roof is not very easy to access and navigate. Our contractor recently repointed our chimney, Sealed the roof and cleaned the skylight, all of which makes me think the entry point must be under the eaves. But my extensive concern is that since it is a row home, the critter might be gaining access through a neighbors house. Any off the cuff thoughts ? I know that wasn't very specific so it might be challenging to respond to. Hi David, I purchased this home 2.5 years ago when I retired and it was in terrible shape, covered in poison ivy to the roof on 2 sides and was home to many squirrels. The house was gutted in many areas and repaired as much as I had money to do. Their were originally squirrels that lived in the chimney, the wall next to the chimney, the middle kitchen wall and of course the attic. I love the squirrels and they eat probably half of the bird seed outside which I don't really mind. However I can't let them live in the walls or attic because they will do terrible damage and might even cause my house to burn down. Well the fireplace was repaired and sealed , the walls were torn down and replaced, and the attic gable vent (which was where they would come in) was repaired with hardware wire on the inside. About 2 or 3 months ago I heard a squirrel get in to the attic. She had probably been born there as I wouldn't let the construction guys in the beginning do anything to the attic squirrels except put a one way excluder thing in for me. Anyway a few months ago a squirrel got in the attic, I called this guy to come repair the wire screen for me. Where she came in was right above my bedroom so I knew when she came in. He repaired the screen and searched for babies and could not locate any. I told him if I saw her pannicking to get back in that he would have to come back and open it up again. Anyway I watched her for days and she was not pannicking or trying to get back in. That was about a month or so ago. Today I saw her on the outside of the gable vent and it looks like she has almost chewed a hole in the wall next to the vent. How can I get her to stop? If I put like metal flashing around the gable vent will that make her stop? I don't want to harm her but I cannot allow her to live in the attic. This vent is 2 stories up so whatever I get done to it I have to pay for. I was hoping that when the guy put up new wire that would work but it looks like she is working around that. Thanks for your assistance or anything you can tell me to do. If you have a squirrel problem in Baltimore City County Maryland, or any other conflict with a wild animal, I am confident that we can solve it. We use humane methods when dealing with Baltimore wildlife removal situations. Squirrel Control Baltimore. Our company is fully licensed and insured in Maryland. Call us any time at 410-844-0455 for a price quote and to schedule a same-day or next-day appointment to solve your squirrel problem in Baltimore.